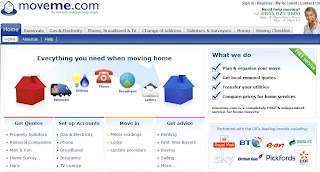 Moveme.com is a resourceful website and service solution for those looking to relocate their home/office in UK. Unlike the normal movers and packers who just transport your household goods, Moveme.com helps in multiple other ways- they help set up your utility accounts (gas, telephone, electricity, insurance and so on. This takes care of most of the workload off your shoulders while you’re relocating. Moveme.com helps you in cheap conveyancing, so that you can move your goods at low expenses. It gets you conveyancing quote from multiple operators so that you get to select the best. Website also has an advise section which offers various useful tips on renting, buying and selling. Moveme seems to have partnered with several reputed brands of UK- Sky, BT, Royal Mall, British Gas and others. This partnership is guaranteed to give them an edge over others and indirectly bring better deals and greater quality service to their customers. Site has a very nice design. Well optimized and all important things a prospective mover (or shall I say relocator) would need is right there. Move me has verisign certified payment gateway, and its moving checklist and information on what to do at what stage of relocation can be very helpful to its customers. Not to mention the actual conveyancing that is taken care so well.